How long does the strength boost on Berserker last? Like with typical strength boosts from icebreakers, Berserker resets at the end of each encounter. If the Runner encounters a Galahad, how much strength does Berserker gain? If it is currently the Runner’s turn, Berserker’s ability must trigger before Galahad’s ability, so Berserker gains 1 strength (for Galahad's printed “End the run.”) before Galahad gains any additional subroutines. If it is currently the Corp’s turn, Galahad must go first, so it can gain subroutines before Berserker checks the number of subroutines and gains strength. Just looking at the raw break cost this isn't a good card. Since Beserker costs the same as paperclip both in install cost and influence and doesn't install from heap it's clearly inferior. Only in two places is it a whole credit cheaper than Paperclip: 4 strength 2 sub (Eli 1.0) and 6 strength 4 sub (no such ice exists). 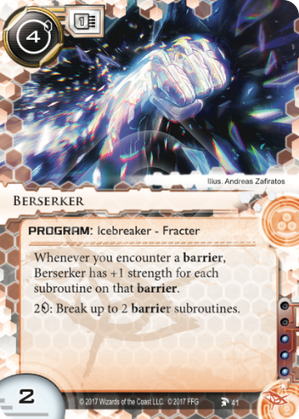 I've been teaching and playing Netrunner with my wife in a Cache Refresh environment, and we've found that Berserker can pull a lot of weight there. Paperclip will be out of that environment very shortly, so this may very well be the go-to fracter. Also, I have a pet theory that this, Street Magic, and Persephone are all the embryonic form of an Anarch sub theme of screwing around with subroutines. I'll eat a copy of Leviathan if we don't get an Anarch card that adds subroutines to ice by the end of our next cycle. Oh, by itself it is pretty terrible. Right now it probably isn't a good measure. It plays okay with Sifr support, but Morningstar does it a lot better if you want to just dominate barriers and it feels kind of odd to require Sifr for barriers unless you get a huge savings. Its only really good target right now is Eli 1.0. Yeesh... nevermind. This is just bad. Sorry guys. I tried. Its a barrier breaker that requires support... which means it should be giving you a lot more than simply breaking subroutines at an okay rate.